GE Industrial Type THQL 2-Pole molded case circuit breaker with shunt trip is rated at 100-Amps and 120/240-Volt AC. It has interrupt current rating of 10-Kilo-Amps at 120-Volt AC. This 1-Phase circuit breaker has fixed thermal-magnetic, non-interchangeable and internal common type trip. It measures 2-Inch x 2-3/8-Inch x 3-9/32-Inch. 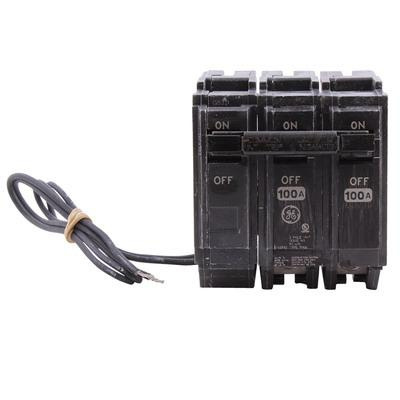 This plug-in mounted circuit breaker with box type terminal connection, accommodates copper wire of size 6-1/0-AWG and aluminum wire of size 4-1/0-AWG. It is suitable to use on AL Series panelboards, residential and commercial applications. Circuit breaker is UL listed.